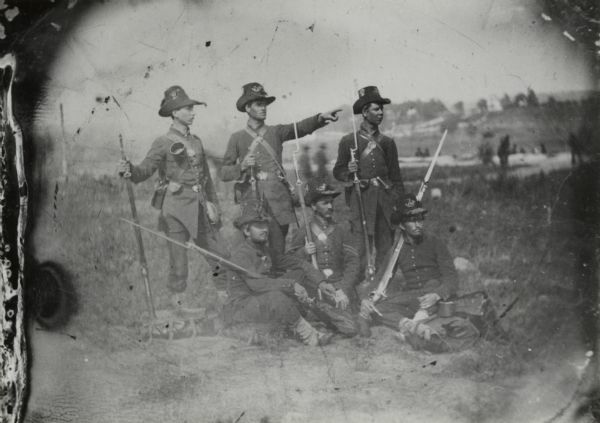 Six Wisconsin soldiers that were part of the Iron Brigade, a unit comprised of soldiers from Wisconsin, Indiana, and Michigan that was known for its determined fighting ability. This group has been tentatively identified as members of Co. C of the 2nd Wisconsin, and the individual seated in the center is thought to be Corporal Spencer Train. All of the soldiers are wearing the black Hardee hats, frock coats, and leggings characteristic of the Iron Brigade, and it may be that the photograph was taken soon after the uniforms were issued to show the men fully equipped. If the corporal is indeed Train, the picture was taken between October 1861, when blue uniforms replaced the gray originally issued by the state of Wisconsin and August 1862, when Train was promoted to sergeant. Train died in 1863 from wounds received at Gettysburg. Copied from a tintype presented by Majorie Allesi, Lakewood, New York, 1977. No copy negative number is indicated.